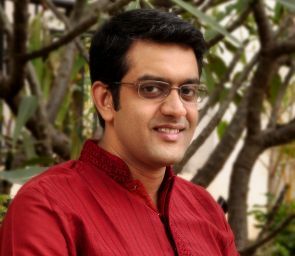 Vikram Sampath's love for Bangalore Litfest equals his passion for music and history, say his friends. With a beautiful, well-polished gramophone resting on a mantle behind his desk, and a framed picture of Prime Minister Narendra Modi taking a dekko at the three books authored by him, Vikram Sampath sits comfortably in his new office in Bengaluru. On an adjacent shelf are two more pictures with similar contents, only this time it's Sonia Gandhi and Hamid Ansari instead of Modi. The Indian classical music enthusiast, who has authored the biography of Gauhar Jaan, India's first recorded voice, remembers the time that he was invited by Congress president Sonia Gandhi to 10 Janpath to talk about the book. "Sonia and Rajiv Gandhi used to collect old gramophone records and they had heard Gauhar Jaan; I found that she (Sonia) was quite acquainted with Indian classical music, we talked about Kishori Amonkar and the Jaipur-Atrauli gharana," says Sampath. His meeting with the prime minister happened earlier this year, when he was a writer-in-residence at the Rashtrapati Bhavan. "He's so sharp. He looks you straight in the eye and has an impressive aura," says Sampath about Modi. In his latest avatar, Sampath is the new director of Symbiosis Institute of Media and Communication, Bengaluru. On a notice board in his office is a paper cutout of a yellow star that reads: The winner is Vikram Sampath. He laughs at nothing in particular and says, "The faculty here had a quiz competition; I really had no idea I was good with Bollywood." On his desk is a pile of newspapers that he's just gone through. "Satirists are having a ball of a time and there's no steam in the intolerance debate anymore," he says, adding how opposing sides still refuse to let it go. There's good reason why the coverage irks him: after all, he was in the eye of the storm after his views on Tipu Sultan and 'award wapsi' weren't taken kindly by a few. But that was just the lull; the storm came later, when three authors did an ‘invitation wapsi’ on him by withdrawing from the Bangalore Literature Festival. Sampath co-founded the festival four years ago and served as the festival director till he recently resigned. "They had a problem with me, not the festival. So if this brings them back, why not?" he asks rhetorically. He says he's learning how Twitter works. "Suddenly, after all the recent brouhaha, my notification tells me that I have 1,000 new followers. And I've become a bit of a celebrity on campus right now with all these television cameras and debates. Maybe the students will respect me more now," he says laughingly. The techie-turned-writer doesn't exactly have to move heaven and earth for that respect. At 35, he's the former executive director of the Indira Gandhi Centre for the Arts, South Zone. His book on the royals of Mysuru is considered one of the most definite accounts of the Wodeyar dynasty in recent times. And, besides the biography of Gauhar Jaan, he's also authored the biography of veena maestro S Balachander. Adding to the list of enviable credentials is Sampath's association with the Archive of Indian Music that he kickstarted in 2011. The idea behind AIM is to preserve, document and make India’s cultural history accessible to everyone. "We have over 50,000 recordings now and we continue to source more from chor bazaars and junk dealers," he says. From recordings of national leaders such as Mahatma Gandhi, Rabindranath Tagore and Subhas Chandra Bose to early cinema, theatre and music, AIM's archives can be accessed through SoundCloud. Sampath is also toying with the idea of a phone app to make AIM more accessible. He had once wanted to become a performing musician, Sampath informs. "Then I decided to contribute to music without getting on stage. Someone needed to be the night watchman for music," he adds. "That era's music was so different from today's; technology has invaded sounds so much now that even musicians are surprised to hear their own voices with all the mixing that takes place," he says. There's a lot more truth, purity and honesty in the voices heard on old recordings, he adds. Sampath is clearly a man driven by passion. He started learning music at the age of four, and his gurus include Bombay Jayshree and Jayanti Kumaresh. Sleeping four hours on an average is the way to go for him, with regular mediation 'to keep him sane'. As a boy of 13, he would spend time in the corridors of places of historical importance, primarily the Mysore Palace, sketching portraits of rajas and maharajas as part of his personal notes. His interest in history only grew when protests broke out across Karnataka after Sanjay Khan's historical drama, The Sword of Tipu Sultan, worked as a polarising factor. "The royal family of Mysuru was shown in very poor light in the show; the maharaja was this obese character who was dancing with courtesans and the maharani was this scheming woman. I was intrigued, and as a child I just wanted to know what the truth was," says Sampath. Even after he went to Birla Institute of Technology and Science, Pilani; did his MBA and joined the corporate world, Mysuru continued to be an obsession. "I became a historian by accident when I put together the book on Mysuru. Everyone called me an amateur historian. In a couple of months, I’ll get my PhD in history from the University of Queensland," says this self-confessed 'sucker' for non-fiction narratives, who is no longer an amateur. Shinie Antony, a neighbour, believes Sampath's passion for music and history equals his love for BLF. Antony, an author herself, is also the co-founder of BLF. "He can be really funny. We car-pool a lot and he has me in splits most of the time," she says. "I don’t know if it was a wise decision for him to step down or not, but it seemed the only thing to do at that point. I think it shows how practical he is," adds Antony. Being a festival director is a crown of thorns, believes Sampath, "I'd joyfully pass it on to someone else. It really is a thankless job." Clearly annoyed by armchair critics, Sampath says, "There was deficit mounting so we have put in our own money into the festival. My challenge to critics would be to have a parallel festival just so that they know how it works." Bengaluru needs a platform, he adds, and if someone can do a better job then please go for it. "But this jeopardising… and all this animosity towards something that makes your city proud, I just don't understand it." Subodh Sankar of Atta Galatta, a popular cultural space and bookstore in the city, says he's a torn man -- Atta Galatta is partnering with BLF to present literary awards. "I do understand Sampath's reasoning to step down. I also see the other side. Atta Galatta is my baby, and if I had to step away from it so that someone else would feel more comfortable, I don't think I could do that," says Sankar. Sampath has put BLF before himself, he adds. "It takes a bigger man to step back like this for 'the greater good'," believes Sankar. "I'm really making the best of this situation. My students have public relations in their curriculum, and this is a perfect example of a crisis situation," he says. "I've told them to do a case study to understand how things blow up, and the nature of social media and more. They are interviewing others, but they can get first-hand inputs from me too," he says.